Now I don’t know about you, but my memory of zoos from childhood was of cages and animals pacing around aimlessly or simply skulking at the back, hoping not to be disturbed. 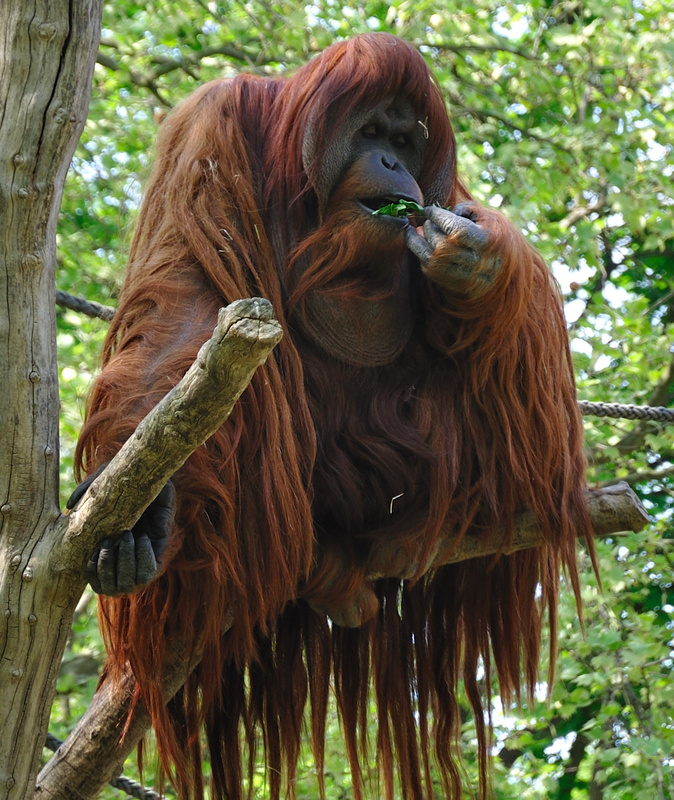 I had been to Gerald Durrell’s Zoo in Jersey about twenty years previously, where they did huge amounts of conservation work and had a fantastic big enclosure for lowland gorillas that had set new standards for animal welfare. But Chester Zoo has taken things a step further, well to be perfectly honest not just a step, but an entire journey into the future. 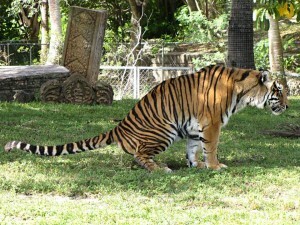 No wonder it is one of the top fifteen zoos in the world according to Forbes Magazine. Over a million and a quarter visitors drop by each year and I can see why the whole place is such a success. It does that very clever thing of educating you by making things interesting and fun. But enough of the promotional messages, let’s get down to the more interesting stuff. What’s it like? What’s worth putting at the top of your list if you do decide to go? And of course what should you avoid? Let’s deal with what to avoid first. It’s simple enough – school holidays, and sunny weekends. As for what to look forward to I guess that depends on your own preferences, but the tigers are certainly going to be pretty high on anyone’s list. Chester Zoo has a number of big cats including Cheetahs, Tigers, Lions (Asiatic ones) and Jaguars. The main thing that makes visiting them worthwhile is that they are all in large areas that mimic pretty natural environments. The downside is that there is plenty of vegetation and the blasted things do what comes naturally and disappear almost in front of your eyes. Fortunately the tigers clearly didn’t give a damn about being on show and just ignored the visitors. That led to a delighted shriek from a young visitor right next to me: “Look it’s having a pee mum!” and it was indeed. Not only did it splash a good gallon or so on the ground right near us, but it then made the kid next to me even more hysterical with laughter when it started sniffing the pool of wee. “I bet you wouldn’t let me do that, would ya Mum?” shrieked the little kid. “No, not unless you were suddenly capable of ripping me limb from limb and eating me, like that one!” came the response. In fact listening to children’s reactions to all the various animals added to an already entertaining day. However hearing some of the adults trying to tell their children about the more exotic beasties had me giggling even more. I stared in wonder at the monitor lizard on show. Wondering how on earth it could even get into a Kimono, let alone wander around in one, biting things and leaving them to die. 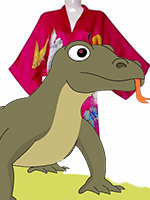 Sadly I didn’t have the nerve to say anything to correct the guy and so at some point in the future a young boy will get laughed at for suggesting that there are big lizards that wear flappy Japanese robes and bite you to death! The giraffes were as elegant and graceful as ever and the Okapi in the pen next to them was probably the weirdest looking animal I had seen for a while. If you haven’t seen one before all you have to do is find one of those children’s books where you make animals up by putting different parts together. The Okapi has stripey back legs like a zebra, a face that Da Boss swore was from a kangaroo (I would suggest more of a giraffe) and a middle section from a horse. They are very difficult to find and are only found in one small area of Africa. The single weirdest fact about them is that they are about the only animal in the world that can lick its own ear!The Asiatic lions, and elephants were OK, but not particularly inspiring, somehow the African versions do seem more impressive. Having said that, when the lion decided to test out its vocal chords and roared, it certainly grabbed my attention. It’s easy to see why people freeze at the sound! But the highlight for me was a rumpled old sack on a ledge. Well OK the sack didn’t grab my attention until it suddenly turned from being a pile of old bits of reddish brown hair and sacking into a huge Orang Utan. I kid you not, it was enormous and made that orang in the Clint Eastwood film look like a baby doll! This one was indeed the Daddy! And as it effortlessly shinned up a set of ropes in a deceptively slow way you realised that it had absolutely no need to hurry. With a reach of about six feet it had climbed up about forty or fifty feet in seconds. It then carefully worked its fingers through the wire mesh and picked out some fruit that had been put there deliberately to encourage it to amuse and stimulate it. 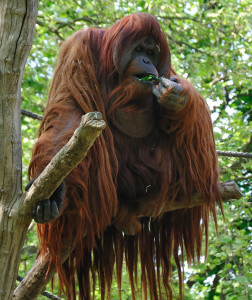 Yep, the big cats were amazing, but if I get a choice in reincarnation I think I would opt for the chance to be an Orang Utan. I can promise you that a slap from one of those would certainly put you in your place! If you do fancy a visit then make sure you take your camera, even I was able to get some pictures that look interesting, and with a little patience you might even be able to get shots that don’t involve the backside of every animal in the zoo! Choose your time well and find out if there are any times for talks, they will really add to your enjoyment. And finally, decide on a couple of key animals you really want to see and visit those first, before you or the rest of your party start to flag with exhaustion. We spotted quite a number of parents who were clearly getting to the end of their tether as their children were becoming fractious! And finally two questions. If Noah only took two of each animal on board, how did he stop all the lions, tigers, and other predators from munching the grass eaters? Oh and whose job was it to clear out all the dung?